Four Seasons Hotels and Resorts, the world’s leading luxury hospitality company, will present the third installment of its original global event series in Miami aboard KISMET, a custom designed 95 metre (312 foot) superyacht. The latest Four Seasons Pop Down comes hot off the heels of transforming a former Philadelphia high school into a surreal rooftop garden. The international roster of Four Seasons artisans traveling to Miami include Daniel Boulud of Café Boulud and d|bar at Four Seasons Hotel Toronto and Mauro Colagreco, Chef Collaborator, Four Seasons Resort Palm Beach, as well as Chefs Aaron Brooks of Four Seasons Hotel Miami and Antonio Mermolia of Le Sirenuse Miami at Four Seasons Hotel at The Surf Club, Surfside, Florida. As part of the Four Seasons Pop Down Miami experience, from December 4 to 9, 2018, members of the public are invited to witness the debut of the latest Skynet artwork by Patrick Shearn and his Poetic Kinetics team, presented by Four Seasons. The art installation, titled Glass Horizon, is the first of the artist’s renowned series to appear on the east coast and will be a must-see public installation for art lovers at Island Gardens Marina. Onlookers are encouraged to experience, enjoy, and share using the #FourSeasonsPopDown and #GlassHorizon hashtags. Public hours are December 4, 2:00–6:00 pm, December 5 through 8, 10:00 am – 6:00 pm, and December 9, 10:00 am – 2:00 pm. During the one-night only event on December 7, 2018, two-storey video walls on board KISMET will display in time lapse images the artistic process of celebrated Barcelona-born artist Ignasi Monreal, whose work is featured in Four Seasons: The Art of Hospitality. The brand’s newly launched coffee table book from Assouline Publishing showcases playful and evocative digital paintings inspired by the people of Four Seasons. The luxury superyacht KISMET, long favoured by celebrities for private vacations, is owned by Shahid Khan, owner of Four Seasons Hotel Toronto, as well as the Jacksonville Jaguars and Fulham FC sports teams. KISMET boasts a main salon, outdoor decks, helipad, half basketball court, DJ area, spa, reception space, dining room, multi-level swimming pools, bars and screening room. Exclusively for this event, NetJets will continue its collaboration with Four Seasons by hosting a lounge on KISMET’s top deck, where guests can enjoy cocktails and savoury bites fresh off the grill from a unique vantage point. Glass Horizon is the latest kinetic art installation of Patrick Shearn’s Skynet series, designed to evoke the movements of nature, such as the fish shoals of the Atlantic Ocean. The series made its debut in Los Angeles with Liquid Shard in 2016, famously transforming an underused public square in the heart of downtown into a bustling destination overnight. Shearn has since exhibited his larger-than-life, moving installations worldwide. Four Seasons Pop Down Miami is the third in an innovative series of immersive global events in unexpected locations, each with unique themes brought to life by a selected team of Four Seasons artists and visionaries from around the world. Four Seasons Pop Down was launched in Toronto in 2017, followed by Philadelphia in September 2018. Following the Miami event in December 2018, the series will continue with the next Pop Down in Hong Kong in early 2019. 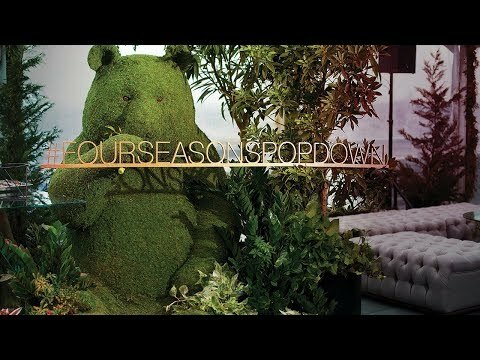 For the latest news on Four Seasons Pop Down events, themes and locations, follow @FourSeasonsPR #FourSeasonsPopDown and visit press.fourseasons.com.